Finally, finally, finally I have for you one first version of the American sign language alphabet for Fingeralphabet.org! 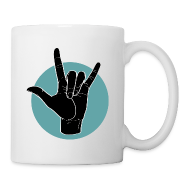 Fingeralphabet USA, the ASL sign language alphabet, is ready for download – just follow the link. And thanks Dr. M.J. Bienvenu from Gallaudet University for helping me finetune the illustrations to make sure that all the information is absolutely correct. And many thanks to Ms Asiah Mason, Gallaudet University, International Relations, who helped me contact Dr. M.J. Bienvenu in the first place. You will see a difference right away: I am using my “gloves” for this version AND there are no color variations. But there will be. I just want to find a more speedy way to pass new material on to you. I did post more about the whys and hows of this new method on the fingeralphabet.org-blog a while ago. And please pass this information on in case you know someone who could use it. The manuals offer the room to approach the subject on more angles. Not only are the hand-signs shown from two perspectives, but I have also included the approved signs for the numbers 0-9 and some general information as to best use and how-tos. The manuals are real books and ebooks and published by a real publishing company with an ISBN number and everything necessary to hopefully get them into libraries eventually. While LegendaryMedia cannot offer the books for free, I can make sure that the price is kept to a minimum by providing the illustrations, the cover, and inside layout myself. The downside is, that by providing all of content myself, it generally takes a bit of extra time until I get around to do it. I will make an announcement as soon as the manual is available. I am happy to say that the main illustrations look very good on our office Kobo devices. If you go to LegendaryMedia Publishing and choose your desired reference manual, you will find a link to the respective Kobo store. These ebooks contain expanded information and target libraries, above all. You could help by pointing this out to your favorite local library. It has been a bit more troublesome to get the ebooks into the iBookstore. After sorting out some technical quirks that had all the Fingeralphabet books constantly overwriting the same basic file – thus always resulting in one Frankenstein kind of monster-book. I am now trying to get the books approved despite of the fact that “Lassal” is just one official and approved artist name that cannot be split into first and last name. Believe me when I tell you that chosing one single name as an artist name was the biggest mistake of my career! While the aim was to simplify things, it made my life utterly complicated. All but the Danish Fingeralphabet are available in the iBookstore now. They are still insisting on an additional first name for this book. Anyway, there are links to the iBookstore over at the publisher’s webpage. I hope you can pass this information on to your local library. And I hope the Danish Fingeralphabet will become available eventually, too. The German Prize for Civic Engagement aims at strengthening the recognition of citizen engagement in Germany, as well as increasing its visibility. I am happy to announce that I was nominated for Fingeralphabet.org. While I hope that the free material on Fingeralphabet.org and the additional material published by LegendaryMedia will be able to offer help in many ways, they unfortunately can only accomplish this if people know about their existence. Given that I cannot come up with a traditional worldwide advertising campaign for this project, Fingeralphabet.org relies totally on word-of-mouth. Word-of-mouth is one of the reasons why I am so very happy about the nomination for the German Prize for Civic Engagement 2013. I hope that the nomination will spread the word and more awareness throughout the world, making more people take notice of the available material. I defined a page for Fingeralphabet.org on Google+. Trying to update all information there right now, which is going to take a while. I added additional accounts for Pinterest a while ago. I am keeping it updated as I go (but only with original Fingeralphabet.org-posts). In addition to Pinterest, I also added a Tumblr account recently. I have not really figured out what to do with it. We will see. I added more downloadable images in Share it / coloring pictures. You can find the whole collection of sign comparisons here (I am continuously adding to it). This entry was posted on Sunday, July 14th, 2013 at 14:27. It is filed under General Information. You can follow any responses to this entry through the RSS 2.0 feed.